You forgot to download Flex GIF Animator	. Click the link below to download it. If you have a website or personal blog and you want to make things a bit livelier, you could post a GIF animation. Or you could get some funny images and use them to create GIF animations to post on Senor GIF or another similar site. Whatever your reason for creating a GIF animation may be, one thing is for sure: you can easily create and edit GIF animations with the Flex GIF Animator software application. To get started with the application, you will first have to download a 6.2MB archive onto your computer. Then you have to extract its contents and run the executable file inside. A setup wizard will then guide you through the process of installing Flex GIF Animator on your Windows-powered computer. You should be done with all this in very little time. The interface is typical of what you would expect from an application of this type. There is a large preview window that displays the animation you’re working on. Shortcuts to all the main functions are on the left and at the top. The main menus are at the top as well. Novices will have to go through a learning curve to get accustomed to the interface and all the buttons. Advanced and expert users who have used photo editing applications before should not have much trouble getting accustomed to Flex GIF Animator’s interface and functionality. Speaking about functionality, there are a few things that need to be added to what Flex GIF Animator does. As mentioned above, you can use Flex GIF Animator to create GIF animations and edit existing animations. Focusing on the “create GIF animations” part, it must be said that you can import pictures and movie frames, and you can capture frames from videos (DV, MPG, AVI, MOV, FLASH and other formats are supported). You can edit the images you want to use by adding text, shapes, curves, gradients, glow and other effects. You can also add sound to your animation. When you’re done, you can save your work as a GIF animation, but also as a SWF Flash, Quicktime, or AVI file. You can give Flex GIF Animator a try for free for a period of 15 days. Once the trial period is over, you will have to get a license to keep using the application. 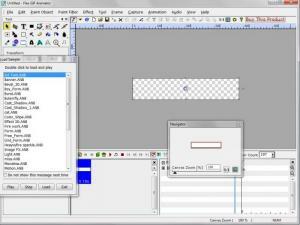 It is amazingly simple to create an edit GIF animation with the Flex GIF Animator software application. Simple and rapid installation process. The interface is just what you would expect from an application of this type. Powerful editing capabilities. Import images, capture images from videos. Save your creation as a GIF animation, Flash file, or AVI video. 15-day trial, demo watermark on output. Click the bottom part of the interface and your browser launches and directs you to the developer’s website. You can download Flex GIF Animator free here.